According to jazzdisco.org, this album was recorded in four sessions from 1952 to 1954. 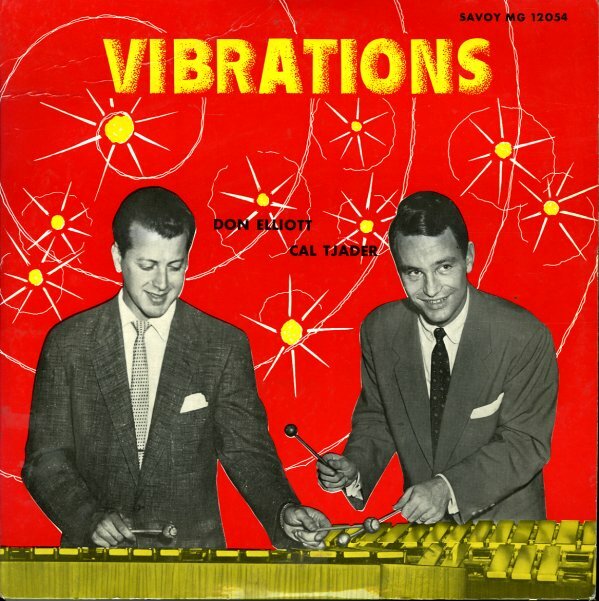 Half of the record features Cal Tjader, and the other half features Don Elliott. "Vibrations" has been re-released as a CD and as an MP3 album. The tracks from "The Versatile Don Elliott" are also on this album. On the digital version of the album the tracks with Don Elliott are 8-14. Track 8, "Take Me Out to the Ball Game", is a fun, upbeat rendition of the song featuring Don on trumpet and Douglass Duke on organ, giving the tune the feel of an old radio broadcast. Around two minutes into the track, Don gives an energetic vibraphone solo. Track 9, "A Stranger in Town", is an emotional mellophone ballad. It features seamless multitrack recording with vibraphone and mellophone solos overlapping and vibraphone accompaniment to the mellophone solos. Track 10, "Darn that Dream", is a middle-tempo mellophone feature with another excellent mellophone solo and a vibraphone solo with some subtle mellophone overdubs. It also has a trombone solo. As reviewed in Billboard, this "arrangement of the oldie creates a dreamy mood as played by the septet. Trombone solo work is smooth" (see source).